A package of ecstasy pills is seen in this handout photo provided U.S. Naval Criminal Investigative Service.Canada’s been getting a lot of attention from the UN Office on Drugs and Crime lately. For all the wrong reasons. The office publishes a World Drug Report every two years, tracking trends in the proliferation, manufacture, export, use and abuse of illicit drugs around the world. 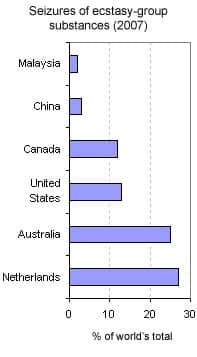 In its 2007 report, the UN found that Canada led the industrialized world in marijuana use, at least when calculated as a percentage of population. 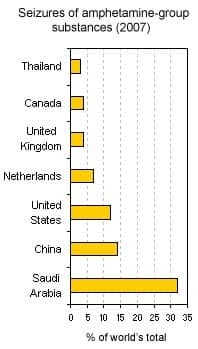 In its 2009 report, Canada is cited as the leading supplier of ecstasy in North America as well as a major producer and shipper of methamphetamine for markets around the world. The report cites the growing influence of gangs — Asian gangs on the West Coast and outlaw motorcycle gangs in central Canada. The report says the Canadian-based trade in methamphetamine has grown so much since 2003 that by 2007, 83 per cent of all methamphetamine seized in Australia came from Canada. In Japan, the figure was 62 per cent. The report notes that in 2006, only five per cent of the methamphetamine manufactured in Canada was exported. A year later, that figure was 20 per cent. It’s a similar trend for the street drug ecstasy. Since 2003, the report says, Canada has emerged as the primary source of ecstasy for North American markets. In 2007, 50 per cent of the ecstasy produced in labs in Canada was exported – mostly to the United States, Australia and Japan. In 2007, Japan identified Canada as the single biggest source for seized ecstasy tablets, followed by the Netherlands, Germany, and Belgium. The report says much of the trade is controlled by Asian gangs that bring in the chemicals they need by ship from China. Steve Walton, a former Calgary police detective and street drug expert, says organized criminals are exploiting what they see as a weakness in Canada’s justice system. Walton said Canada’s large coastlines are difficult to monitor, making it easier for organized criminals to get their product out of the country. “This will continue in Canada until the drug laws catch up with the criminals,” he said. Canadian youth appear to be continuing a trend to less illicit drug use overall. The report found that the numbers suggest that the availability of cocaine has dropped to levels not seen since the late 1980s. Surveys of high school students in Ontario showed a drop of 35 per cent in the prevalence of cocaine use between 2003 and 2007. Overall, the survey shows that by 2004, 10.6 per cent of Canadians between the ages of 15 and above had tried cocaine at least once in their lives. In the U.S., the figure was 17.8 per cent. The report says cannabis consumption is continuing to decline in North America. In the United States, 10.1 per cent of the population aged 12 or older had tried cannabis in 2007. In 2004, the most recent year for which statistics are available, 14.1 per cent of Canadians aged 15 or older had tried the drug. B.C. reported an even higher rate of 16.8 per cent. Global users estimated at between 11.58 million and 23.51 million of people aged 15-64. The UN Office on Drugs and Crime says there aren’t a lot of laboratories that make ecstasy around the world — but each of them is highly profitable and pumping out a lot of drugs. Manufacturing was limited to eight countries: Australia, Indonesia, Canada, the U.S., Netherlands, France, Mexico and Spain. The most significant development in ecstasy manufacturing, the report says, has been the shift of operations from west and central Europe to locations closer to consumers around the world. Canada has emerged as the leading supplier to the North American market . Global users estimated at between 142.58 million and 190.27 million of people aged 15-64. According to the World Drug Report, cannabis is cultivated in most of the world’s countries, usually for local use or regional export. North America’s biggest producers are the U.S. and Mexico with Canada a distant third. According to Interpol, North America produces a third of the world’s pot. However, the World Drug Report says cannabis consumption continues to stabilize or decline across North America. Some Central and South American countries are reporting increases, but overall use in those countries remains below North American levels. Some African and Asian countries are reporting increases in marijuana consumption as well, while cannabis use is stabilizing or declining in most of Europe and Oceania. Global users estimated at between 15.16 million and 21.13 million of people aged 15-64. Afghanistan continues to be the main source of the world’s opium supply. However, cultivation of the opium poppy decreased by 18 per cent in 2008. The total area under cultivation in the world’s three main producers (Afghanistan, Myanmar and Lao) fell to 189,000 hectares. Heroine and other opiates remain the world’s main problem drug in terms of treating users. Most of the world’s users live in Asia. The rate of consumption has been stable in Canada and the U.S. for years. Some African countries are reporting increased use as is Mexico and Argentina. Global users estimated at between 15.63 million and 20.76 million of people aged 15-64. The world’s major producers of cocaine continue to be Colombia, Bolivia and Peru. Production decreased by 15 per cent in 2008 to 845 tonnes compared to 2007. The UN Office on Drugs and Crime estimates that about 41 per cent of cocaine is seized before it reaches its intended market. Cocaine production has remained fairly stable in Bolivia and Peru, but it’s been dropping in Colombia, to levels not seen since the 1990s. Cocaine consumption in North America remains on a downward trend. Global users estimated at between 15.82 million and 50.57 million of people aged 15-64. The World Drug Report estimates that about half of stimulant users in North America use methamphetamine. The total number of amphetamine users in North America is estimated at around 3.8 million people, or 1.3 per cent of the population aged 15-64. However, rates of use are growing more quickly in the developing world than in the developed world. Methamphetamine was identified as the “most used” illicit drug in Cambodia, Japan, Lao People’s Democratic Republic, the Philippines, the Republic of Korea and Thailand. Canada has emerged as a major producer and shipper of methamphetamine for markets around the world.